MAHALLY is a homegrown Egyptian furniture store with its success rooted in the artful historic conceptions of sweet Egyptian cultures coalesced with contemporary design. “Local Pride” in products that are designed and manufactured in Egypt.Pride of being “My Store” for each and every designers who displays their creative products in MAHALLY. Mahally exhibits new and innovative designs of home accessories, lighting fixtures, paintings, photography and furniture. The products in Mahally are all locally made as well as inspired by our culture and by our nature. Also, we welcome Egyptian designers to use Mahally as a platform for showcasing their talents because the best outcomes are through collaboration. The design twist behind Mahally is that it harnesses the background of our heritage and culture while translating it into contemporary furniture design pieces. 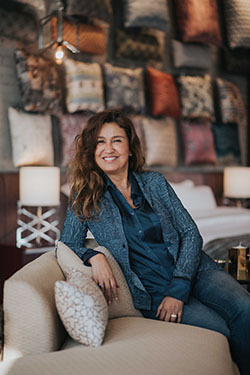 Mona Hussein is the owner of Mahally and co-founder of Mona Hussein Design House - MHDH, a leading design firm based in Cairo, Egypt. Her passion for design allowed her to make time dedicated to opening a store that would put Egyptian furniture on a global map.